Oh give thanks to the LORD; call upon his name; make known his deeds among the peoples! (Ps. 105:1). Thank the LORD for his steadfast love, for his wondrous works to the children of man! (Ps. 107:8). The book of Colossians also carries the theme of thanksgiving. In Colossians 3:15–17, Paul mentions thankfulness three different times, one of them being, “Let the peace of Christ rule in your hearts, to which indeed you were called in one body. And be thankful” (v. 15). Likewise, 1 Thessalonians 5:18 reminds us that it is God’s will to give thanks in all circumstances. 1. Fill your mind with the truths of God’s Word. Meditate on verses regarding thankfulness like Colossians 3:15–17. Memorize God’s commands to be thankful. 2. Remember God’s goodness and faithfulness to you. Just as the Israelites were prone to forget all God had done for them during their time in the wilderness, so we too can forget. The discipline of remembering God’s blessings through writing them down or retelling them to others has a way of stirring up gratitude in our hearts. 3. Ask God to put a guard over your mouth. Instead of venting your frustrations from each day, look for reasons to rejoice. An attitude of gratitude is just as easily spread as a complaining spirit. Seek to be known as a Spirit-filled, joyful person, instead of a whining, disgruntled one. 4. Aim to make gratefulness your knee-jerk reaction to your circumstances. When you hear news for the first time, ask yourself, What can I be grateful for in this circumstance? I always remember a story of a family that found out their daughter had died suddenly. As they joined hands to pray and mourn, the father first and foremost thanked the Lord for the years they had together. What an example of gratitude, even in the midst of great loss. 5. Put your thankfulness into words. Write down five things to be grateful for as soon as you sense yourself heading down the miry path of despair. Sometimes it’s as simple as a cup of hot tea on a cold day or a flower blooming outside my window. 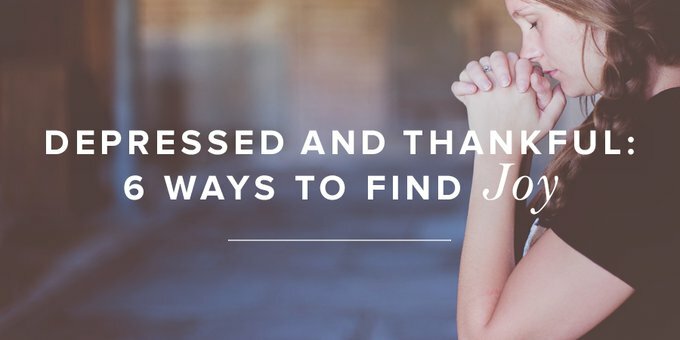 Listing God’s daily blessings has been one of the most transformative things in my life. By putting gratefulness into words—whether spoken or written—an abstract idea like thankfulness becomes much more concrete. 6. Look for specific evidences of God’s grace. Search your life and the lives of others around you for grace. My faith is strengthened when I see God answer a prayer, when I notice the fruit of patience when I don’t cry over spilled milk, or when a long-awaited prayer request for my friend’s desire to be a mom is fulfilled through adoption. Intentionally watching for God at work gives me much to be grateful for. How are you choosing gratitude today? Leave your thoughts in the comments, or send this post to a friend and tell her what you’re grateful for today! A version of this post originally appeared at Desiring God. Used with permission.